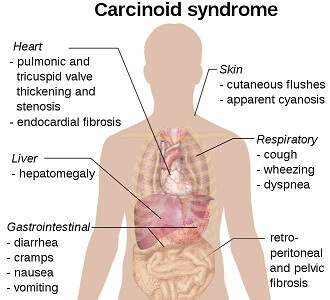 Carcinoid syndrome happens when an uncommon cancerous tumor known as the carcinoid tumor releases particular chemicals into the bloodstream. This causes a multitude of symptoms and signs. 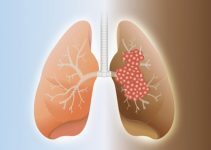 Such tumors are typically found in the lungs or gastrointestinal tract. This syndrome usually occurs in people who have advanced carcinoid tumors, and its treatment generally involves containing and treating cancer. Nevertheless, as most such tumors do not induce this disorder until they reach the advanced stage, a cure for this disease may not be viable. The causative factors of the carcinoid tumors remain undiscovered to date. Some studies did suggest risk factors like dietary intake and nicotine abuse. However, further research is required to validate these findings. In a vast majority of carcinoid syndrome cases, the tumors are found to be slow-growing, which release hormonal chemical substances like tachykinins, bradykinins, serotonin, and prostaglandins. When the primordial carcinoid cells metastasize and spread to the liver, these chemicals are no longer synthesized in inactive states and are liberated into the affected person’s systemic circulation. This situation triggers the signs of carcinoid syndrome. Moreover, when other organs excluding the GI tract are affected by the carcinoid tumor, for instance, the ovaries, this syndrome can appear without liver metastases. 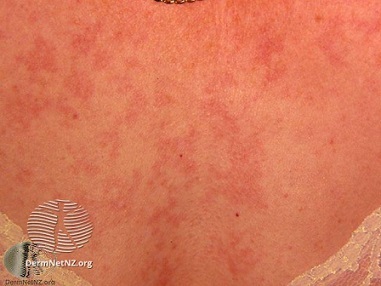 The skin on one’s upper chest and face changes color from pink to a shade of purple and also feels hot. Such flushing episodes could last several hours or even longer too as little as a few minutes, occurring for no evident reason. However, it can sometimes be attributed to alcohol consumption, exercise, or stress. Spider-like, purplish veins could appear on the upper lip and the nose of the affected individual. A doctor will evaluate the patient’s symptoms to eliminate any potential causes of diarrhea and skin flushing. If none are found, the following tests will be done to confirm the diagnosis of carcinoid syndrome. When the human body synthesizes serotonin, the urine of a person may include a specific chemical, and if it present in large amounts, it means that one is processing an additional amount of serotonin, the substance typically released by carcinoid tumors. One’s blood may contain elevated levels of particular chemicals, including a protein known as the chromogranin A, which is secreted by some of the carcinoid tumors. DATs (diagnostic imaging tests) may also be used to identify the location of the primary carcinoid tumor as well as to determine whether or not it has spread. As most such tumors are usually found in one’s GI (gastrointestinal) tract, a CT (computerized tomography) scan of the abdomen is often performed. Other scans like NMSs (nuclear medicine scans) or MRI (magnetic resonance imaging) may prove to be beneficial in specific cases. The entire cancerous tissue or most of it is surgically removed. Injecting drugs like Somatuline Depot (lanreotide) and Sandostatin (octreotide) may help to reduce the symptoms and signs of this disease. 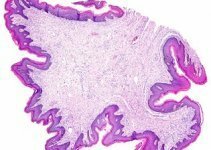 They may even also decelerate the development of carcinoid tumors. Adverse effects of these drugs include bloating, abdominal pain, and diarrhea which may subside eventually. A newer medication known as the Xermelo (telotristat), can be administered along with the drugs mentioned before for controlling diarrhea caused by this disorder. The side effects include depression and nausea. A drug called Interferon Alfa is sometimes injected to stimulate the human immune system so that it can function better. It is meant for relieving the associated symptoms as well as arresting the progress of carcinoid tumors. The side effects include flu-like symptoms and fatigue. In a significantly complicated surgical procedure known as the HAE (hepatic artery embolization), the specialist passes a catheter by means of a fine medical-grade needle near the groin and sutures it to the hepatic artery, which is responsible for supplying blood to the liver. The surgeon injects specially designed particles for blocking this hepatic artery, and thus, cuts of the supply of blood to cancer-causing cells in the patient’s liver. However, the healthy cells of this vital organ continue to survive with the help of other blood vessels. Nonetheless, HAE comes at the cost of substantial risk, and this reasonably complex procedure is usually done only in advanced medical facilities. A needle produces heat in an RFA (radiofrequency ablation) procedure to burn the cancer cells in the patient’s liver. Although the working principle for cryotherapy is precisely the same, it works by causing the tumor to freeze. Cryotherapy and RFA are usually safe. However, there is a little amount of risk of infection and blood loss in the said processes. Chemotherapy may cause the carcinoid tumors to shrink, and any adverse effect a patient may experience will be dependent on the specific chemotherapy drugs one is about to receive. As this disease is associated with the carcinoid tumors, prevention means treating the disorder as soon as the symptoms of such tumors are diagnosed. Almost all the symptoms do respond well to treatment and surgery cures about half the patients. 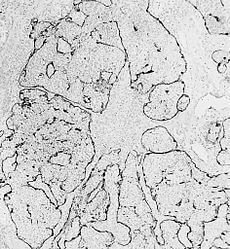 The metastatic disease is observed to increase the mortality rate slightly. If the tumor happens to be well localized, the survival rate is calculated at 95% for five years, and it reduces to around 20% in cases of metastases of the liver.